Random musings of a crazy, crafty, pop culture-obsessed girl! With the success of my crayon pumpkin this year, I thought I’d have fun with some DIY crayon Christmas crafts this weekend! 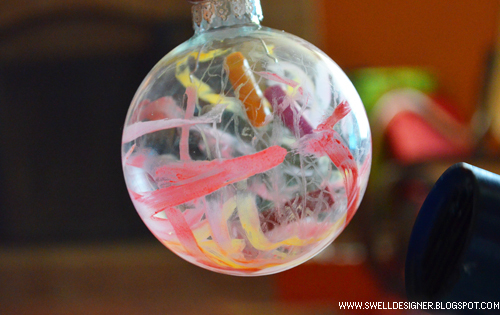 I’ll share some more throughout the week, but this was my most successful one…Crayon drip glass ornaments! 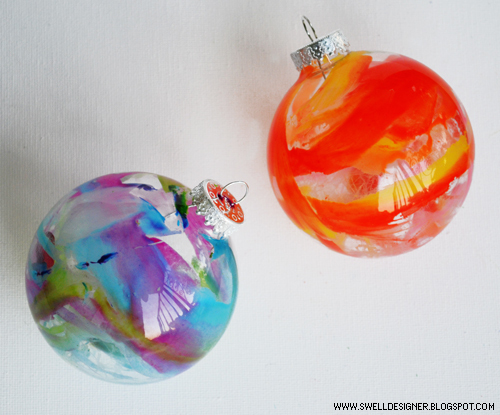 I absolutely love how watercolory and colorful these ornaments turned out and they are SO easy to make. They really only take three things to create. I’m serious! Here’s how you make them! Before you begin: Prepare your area with protective plastic (I used garbage bags) or newspaper. Even though this is a little bit less messy than other crayon crafts, you don’t want the chance of your carpet, table, etc ending up spattered with crayon drippings! 1. I started off by using my craft knife and fingernails to rip off the labels on the crayons. This is the hardest part of the process. Good thing, cause I get impatient! 2. Remove the stem from the glass ornaments carefully. 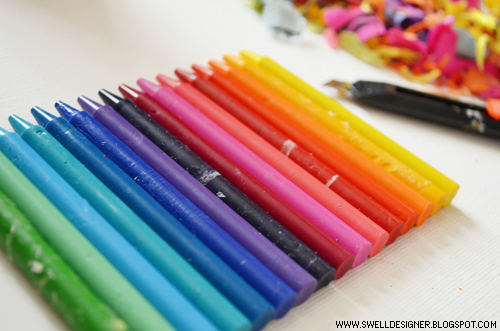 Now cut or break small chunks of your crayon and drop them in. I chose to do no more than 3-4 colors at a time, but feel free to experiment with more or less! 3. With your hair dryer setting on high, blast the heat on the ornament. I found I could handle the ornament if I didn’t hold the heat too long in one spot. I twirled the ornament as they dripped with my hand. Sometimes the crayons were uncontrollable. That’s the beauty of this project, it creates abstract drips…you just have to go with it! 4. I chose to stop before my crayon was absolutely covered on the inside. 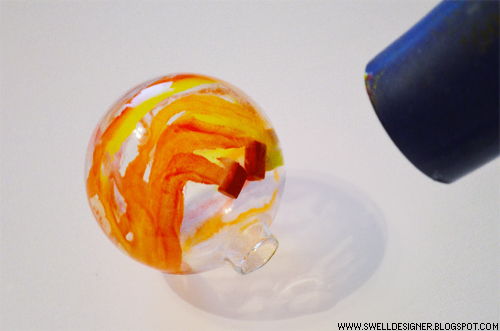 I liked the transparent and scratch effect the crayon wax had with the glass, as you can see in the example above. When you are satisfied, shake or heat the crayons up so they’ll go out the opening. That’s it! You can add a bow or sparkle to the outside if you wish. These would be pretty on a tree, on a gift, or in a glass bowl for a pretty display! Here’s some more pics of my finished creations! I love projects like this, cause it forces me out of my design brain and gets me more into abstract art territory! 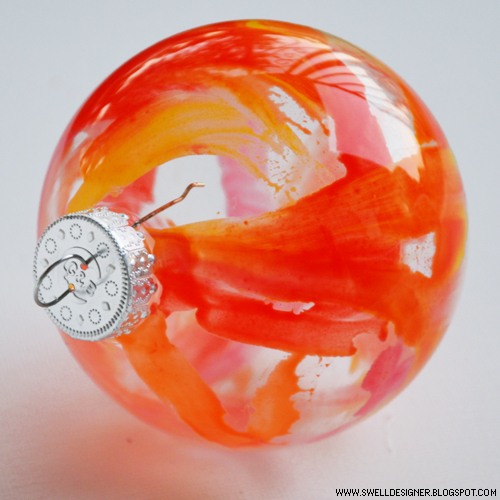 Check out my other fun holiday ornament projects! If you love this project, then sign up for my NEWSLETTER where I share lots of DIY and creative fun. 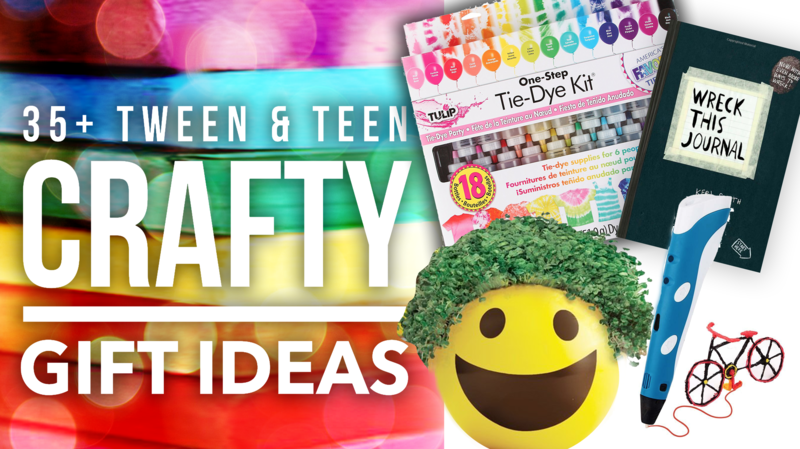 Looking for a crafty gift for your fave teen/tween in your life? Check out my crafty gift guide here. Ok, these are amazing! 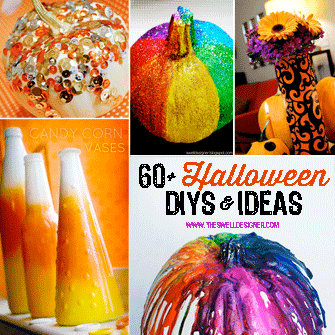 I love the look of these and what a super fun project too!!! Great idea. Thank you for sharing. Love this. I think my grand daughter can do this. I am totally going to do this. In pink. I might use oil pastels so I don’t have to be as patient with the hairdryer and the paper peeling. Yeah! Love this idea!!!! To me this is so much more fun than paint. Posting a photo and link back to your tutorial on my Holiday Blog. Absolutely love these! Can’t wait to make them with my 3 year old daughter. Awesome! Quick question: where’s a good local place to get clear bulbs? Scratch my question. Just saw you got them at michaels! Thanks! These look amazing. Cant wait to try this! Very cute! What a great idea. You know I’m a big fan and absolutely love this idea! Thanks for sharing your creative genius!! I like this but would like to add personalizing them on the outside would be great. Might try. Awesome idea! I have some clear ornaments I bought last year I was planning to paint. I hadn’t thought to use crayons to decorate them but after reading this, I’m going to give it a try. 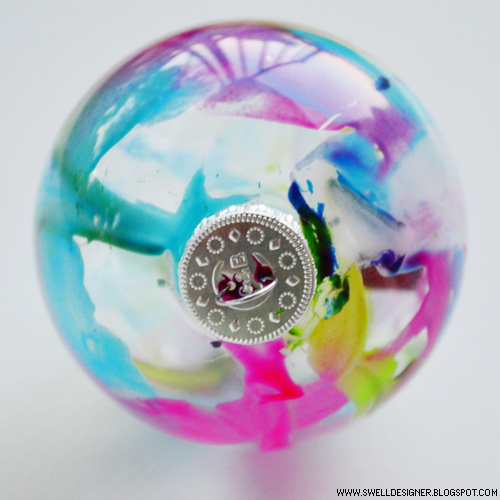 Do you think I could use an embossing heat gun rather than a hair dryer or is that too hot (will it melt the glass?)? Fantastic idea! Thank you!!!! I tried this with my kids the other day. My crayons wouldn’t melt! I had hold my ornament with tongs because I was blasting the hair dryer so long at it. They had the “cheap” crayons. Trying one more time with a different brand. What a great idea. How long did it take for crayons to melt? I also just tried this with off-brand crayons (Craz-Art) and while it worked and they look awesome, all of the colors mixed together. I used shades of blue and purple and pink in one and it came out all dark purple, and I used green, orange,and yellow in the other and it came out all rust colored. I might try the rest with Crayola and see if it makes a difference. Absolutely loved making these, you must use tongs and crayons crayons! I used red, gold, silver, white, different greens, and even some yellow.all in separate ornaments with no more than two colors per. I found I used too big of chunks, I would say if you are wanting more than two colors no more than 1/4 inch of a crayon should do. Mine are gorgeous and they will look so nice on my tree! Thanks! My son and I just made these to give as gifts to his grandparents and teachers! Simple, quick and great results. I pinned this last week, and as of a few minutes ago, 233 people have repinned it from my pinterest page. I don’t have all that many followers, so a lot of people are liking this idea! Just thought you might like to know. Followed the link from Dollar Store Crafts. These turned out lovely and are quite simple. I would think doing too many colors at once would make the colors turn muddy, stopping at 3-4 like you did seems about perfect. Great idea, I never would have thought to do this! I LOVE these! You have such amazing and EASY ideas! 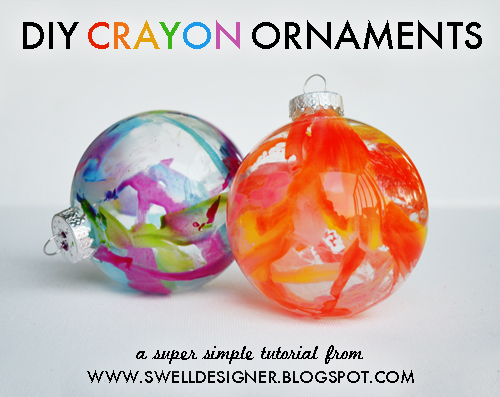 I just posted our crayon ornaments on my blog and linked to you! I’ve also got glow paint and we’ll be making some of those soon. I can’t wait to see what you come up with next! These are fantastic! I love the abstract quality to them and how you’re never sure how it will turn out. It’s like making a fun surprise!! This is a brilliant idea and perfect for kids to do. You selected great color combinations! This is a great idea to use leftover ornaments from last year and random crayons around the house! They look amazing! I’m especially taken with the blue/purples ones, but they are all great. I assumed for tthe tree but you’re right – a bowl of them would be very pretty, too. 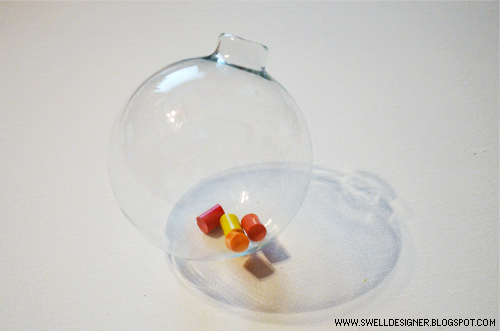 As soon as I can find some glass ornaments, I’m going to give this a go! I think it’s really fun what you have done with these glass christmas ornaments. It was a very creative and cleaver idea. It really makes them look much better than just the plain clear class I think. I’m going to grate the crayons and pour into the ornament in color combos. Should go faster that way, too! Cool! I would try silvers and golds?!? I’m going to try and make these for the school’s Christmas sale! Thanks for stopping by! I hope you enjoy my swell crafts, DIYs, & creativity! And the occasional cat! 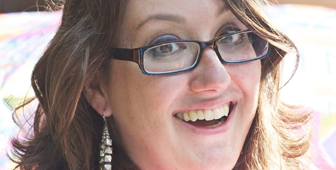 Stay up to date with Alexa & her crafty adventures & projects. Subscribe today!